Donald J. Trump is all the rage at the moment and his ascendance to the GOP primary frontliner has been a shock for most political observers. It is especially strange because the proposals that he is making like partly closing the Internet or making America great again through the sheer power of personality are transparently absurd and border on pronouncements of a shaman. Almost similarly bizarre and unfulfillable promises come from the Democratic candidate, Bernie Sanders. In addition to the shamans, there is another irrational current in the primary campaign represented especially by candidates like Ben Carson and Mike Huckabee. These people believe in the justification or perversity of certain social practices by the mere fact that they seem to them to be required or prohibited in their holy book. While these politicians may seem outliers, they are just somewhat radical versions of the two dominant undercurrents in modern political thinking, leftism and conservatism. One can say that Trump is not exactly conservative because of his economic stances but it is actually an accident of the US political history that many conservatives are more favorable to economic freedom than the left. One is almost forced to ask how it is possible that in the age of enormous scientific and technological progress in a country to which we owe so much of it people can still have political views that are exploited by the likes of Trump, Sanders, Carson and Huckabee. Why do people not massively embrace the alternative to the respective ideologies of leftism and conservatism, or combinations of the two, the alternative whose even moderate application since the end of the 18th century and till the end of the 19th launched an unprecedented wave of human progress? Why after all what illiberal politicians have done in the 20th century are people not turning to liberalism (in the classical and not modern US sense of the word)? The answer to this question may lie in the findings of a person who is probably not known to most people nowadays, one of the founders of modern anthropology Branislaw Malinowski, in particular in his essay “Magic Science and Religion”. These natives, and I am speaking mainly of the Melanesians who inhabit the coral atolls to the N.E. of the main island, the Trobriand Archipelago and the adjoining groups, are expert fishermen, industrious manufacturers and traders, but they rely mainly on gardening for their subsistence. With the most rudimentary implements, a pointed digging-stick and a small axe, they are able to raise crops sufficient to maintain a dense population and even yielding a surplus, which in olden days was allowed to rot unconsumed, and which at present is exported to feed plantation hands. The success in their agriculture depends —besides the excellent natural conditions with which they are favored—upon their extensive knowledge of the classes of the soil, of the various cultivated plants, of the mutual adaptation of these two factors, and, last not least, upon their knowledge of the importance of accurate and hard work. They have to select the soil and the seedlings, they have appropriately to fix the times for clearing and burning the scrub, for planting and weeding, for training the vines of the yam-plants. In all this they are guided by a clear knowledge of weather and seasons, plants and pests, soil and tubers, and by a conviction that this knowledge is true and reliable, that it can be counted upon and must be scrupulously obeyed. […] Can we regard primitive knowledge, which, as we found, is both empirical and rational, as a rudimentary stage of science, or is it not at all related to it? If by science be understood a body of rules and conceptions, based on experience and derived from it by logical inference, embodied in material achievements and in a fixed form of tradition and carried on by some sort of social organization—then there is no doubt that even the lowest savage communities have the beginnings of science, however rudimentary. Most epistemologists would not, however, be satisfied with such a “minimum definition” of science, for it might apply to the rules of an art or craft as well. They would maintain that the rules of science must be laid down explicitly, open to control by experiment and critique by reason. They must not only be rules of practical behavior, but theoretical laws of knowledge. Even accepting this stricture, however, there is hardly any doubt that many of the principles of savage knowledge are scientific in this sense. The native shipwright knows not only practically of buoyancy, leverage, equilibrium, he has to obey these laws not only on water, but while making the canoe he must have the principles in his mind. He instructs his helpers in them. He gives them the traditional rules, and in a crude and simple manner, using his hands, pieces of wood, and a limited technical vocabulary, he explains some general laws of hydrodynamics and equilibrium. Science is not detached from the craft, that is certainly true, it is only a means to an end, it is crude, rudimentary, and inchoate, but with all that it is the matrix from which the higher developments must have sprung. Compare a rite carried out to prevent death in childbed with another typical custom, a ceremony in celebration of a birth. The first rite is carried out as a means to an end, it has a definite practical purpose which is known to all who practice it and can be easily elicited from any native informant. The post-natal ceremony, say a presentation of a new-born or a feast of rejoicing in the event, has no purpose: it is not a means to an end but an end in itself. Religion is also a response to the imperfection of the world but from a different angle. Where magic strives to militate against things that cannot be changed either in principle or with application of the existing knowledge or technology, the essence of religion is to find certain elements of the world that would give consolation in the face of its clear imperfection. The most important such elements in probably all religions are the tradition and the human mind that is considered as an immaterial spirit. In order to grasp better the nature of primitive religious ceremonies and their function, let us analyze the ceremonies of initiation. They present right through the vast range of their occurrence certain striking similarities. Thus the novices have to undergo a more or less protracted period of seclusion and preparation. Then comes initiation proper, in which the youth, passing through a series of ordeals, is finally submitted to an act of bodily mutilation: at the mildest, a slight incision or the knocking out of a tooth; or, more severe, circumcision; or, really cruel and dangerous, an operation such as the sub-incision practised in some Australian tribes. The ordeal is usually associated with the idea of the death and rebirth of the initiated one, which is sometimes enacted in a mimetic performance. But besides the ordeal, less conspicuous and dramatic, but in reality more important, is the second main aspect of initiation: the systematic instruction of the youth in sacred myth and tradition, the gradual unveiling of tribal mysteries and the exhibition of sacred objects. […] To primitive man, never, even under the best conditions, quite free from the threat of starvation, abundance of food is a primary condition of normal life. It means the possibility of looking beyond the daily worries, of paying more attention to the remoter, spiritual aspects of civilization. If we thus consider that food is the main link between man and his surroundings, that by receiving it he feels the forces of destiny and providence, we can see the cultural, nay, biological importance of primitive religion in the sacralization of food. We can see in it the germs of what in higher types of religion will develop into the feeling of dependence upon Providence, of gratitude, and of confidence in it. […] Thus the belief in immortality is the result of a deep emotional revelation, standardized by religion, rather than a primitive philosophic doctrine. Man’s conviction of continued life is one of the supreme gifts of religion, which judges and selects the better of the two alternatives suggested by self-preservation—the hope of continued life and the fear of annihilation. The belief in spirits is the result of the belief in immortality. The substance of which the spirits are made is the full-blooded passion and desire for life, rather than the shadowy stuff which haunts his dreams and illusions. Religion saves man from a surrender to death and destruction, and in doing this it merely makes use of the observations of dreams, shadows, and visions. The real nucleus of animism lies in the deepest emotional fact of human nature, the desire for life. At the first sight, the connection between Malinowski’s observations about primitive tribes and politics in modern highly complex and developed societies may seem tenuous at best but when one looks closer at the essence of the three main political ideologies of today, it becomes difficult not to see magic, science and religion embodied in them. Let us start with leftism. It is obvious that all kinds of people on the left believe with varying degrees of confidence in the possibility for the human societies led by technocrats restricted by democracy to manipulate social outcomes. From the very beginning, leftism was an attempt to address the social problems in a manner similar to that of natural science. Despite the lip service that is paid to science, however, the approach of the left seems to have much more to do with magic, however, because of two key things. First, much of the left’s belief in the benefits of deliberate (whether top-down or democratic) meddling with spontaneous social order is based on disregard or willful misinterpretation of important historic facts. One major line of such misjudgment consists in widespread claims that many kinds of social problems were worsening or at least not improving during the short relatively ‘laissez-faire’ phase in Western history. According to this story, consumers were robbed by monopolies and sold junk and dangerous stuff, workers were mercilessly exploited, there was little or no education for most people, the list could go on indefinitely. A cursory look at the relevant historical facts will show to anyone who wants to see that those beliefs are blatant myths. In addition, while the left has often emphasized the need to scientifically rearrange society and social democrats are fond of reminding us that they are ideology-neutral people who are just looking at where carefully collected evidence collected by social research leads them, there is a big problem with much of that research. The problem is that it is overwhelmingly dominated by methods taken in one way or another, and with different degrees of modification, from natural sciences and engineering. This process went so far that, for instance, finance specialists apply Fourier transforms (a method from electrical engineering) to analyzing the evolution of financial market indices. It has strong similarities with the famous “cargo cults” with figures of planes replaced by misused mathematical and computational instruments. At the same time, a large part of the modern left seems to be completely at odds with the optimism of the Progressive movement. Post-modernists that largely drive this line of thinking generally reject the objectivity of science (whether natural or social) wholesale, attempting to reduce all kinds of social interactions to exercises of power. The difference with the technocratic left, however, is ultimately not a one of principle. A cargo-cult-like, pseudoscientific mysticism is replaced by a strong belief that prima facie harmless acts like jokes or market exchanges are actually exercises of great social power. By trying to control them, the postmodernist left seeks to manage society in no-less direct way than their technocratic brethren, and the foundation of their ideas is every bit as similar to magic. The second major strand in human political thinking – conservatism – corresponds to a different major mode of thinking analyzed by Malinowski – religion. The affinity goes beyond the very close relationship between conservatism and religion in almost every instance. Conservatism always tries to sacralize certain features of society, especially hierarchies and social roles and is suspicious of any changes that may even remotely threaten them. It sometimes tries to rationalize those features but such attempts are usually half-hearted and deeply unconvincing, often boiling down to the idea that although we cannot know why a given social feature has not been weeded out over a long period, it must be beneficial for this very reason. It is also frequently talks about so-called ‘transcendent’ entities and values mirroring the fascination of the primitive cultures with the idea of life and rebirth cycle. The language of patriotism, for example, almost makes one feel that even if one dies defending the transcendent Fatherland one will sort of continue living because one was always part of it, and it is still there. In a similar vein, conservative cultures encourage affection and sacrifice based on blood relations. Leftism and conservatism, thus, respond to the imperfections of the social world like magicians and priests. The only ideology that argues that the imperfections of the social world should be addressed in keeping with the basic knowledge about human beings and society is liberalism. Liberals realize that human beings’ ability to learn, knowledge and good character traits are highly limited but decentralized mechanisms of cooperation and exchange actually allow to put them to use while keeping the human dark side in check. Faced with grandiose schemes of social design from above, it always asks the annoying questions about the possibility of the actually existing humans and institutions to achieve the goals of such schemes and such schemes’ unintended consequences. At the same time, liberals do not accept the claims that certain social institutions an practices or their absence are valuable or to be prevented for their own sake, which puts them sharply at odds with conservatives. The answer to the question why liberalism has so far had such a difficulty in winning in the political realm is that its adversaries correspond to two other fundamental modes of human thinking about the imperfect world. But the fact that science has won out in most other important realms should be the reason for hope. The graph below may contain the answer to the question that haunted the economists for more than 80 years: what sparked the crisis that shaped so much of the social history and economic science that followed it – the US Great Depression. The graph very vividly contains a pattern which my version of the Austrian Business Cycle Theory (see this issue of NPPE and the empirical working paper with application to the Great Recession) predicts should happen in the case of an unsustainable boom caused by a credit expansion. In brief, such a policy may cause investment projects to be started that seem artificially profitable because the prices for certain inputs (which I call the “contested goods”) do not immediately adequately reflect the changed demand for them. Historically, the Federal Reserve embarked at a monetary easing in early 1927. At the time, the American economy was undergoing dramatic productivity improvements. The main engine of such productivity improvements, along with other factors was the process of electrification, especially of the factories, and the accompanying changes in factory organization, e.g. switching from the multi-story to the single-story pattern, and from central motors to unit motors. The input which was and is essential in electrification is copper, and the title of this post is directly polemical in relation to the famous book by Barry Eichengreen that blamed the Great Depression on another metal, that probably wasn’t to blame after all – gold. 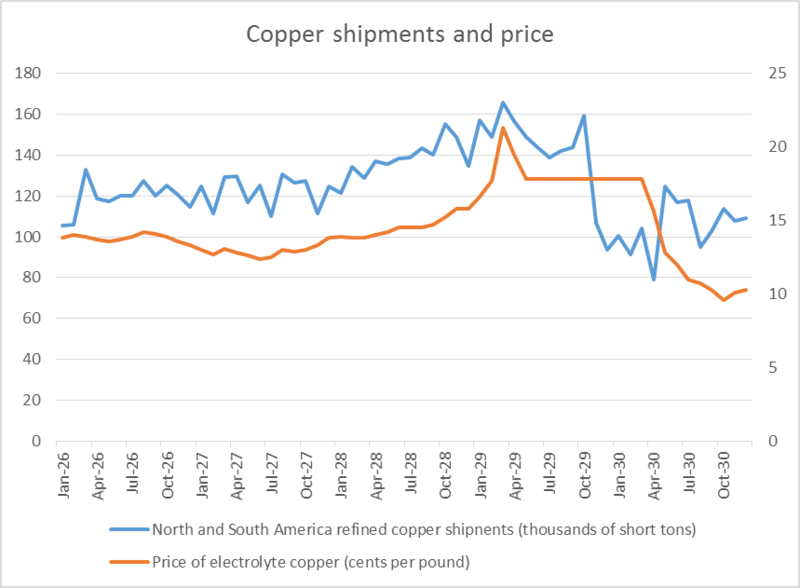 It is visible from the graph that shortly after the start of the credit expansion, copper shipments started taking off but the price of copper followed them only with a lag of around a year, with the final spike from 17,7 to 21,3 cents per pound happening within just one month. After that, the shipments and price fell but still stayed at a level 21% above September 1928. The unsustainable projects were probably kept afloat for some time by new credit creation which followed the relatively tight credit conditions of 1928. But in November 1929 copper shipments collapsed by staggering 33%. The costs related to copper were also highly significant. Its price rose by 44% between September 1928 and March 1929 to reach 21,3 cents per pound. The shipments data are in thousands of short tons, and the price for copper is in cents per pound. Thus, if we assume that at the peak consumption in March 1929 the US economy accounted for 150 thousand short tons, at the price of 21 cent per pound, this would have constituted around $63 mln. in the then current prices just in that month alone, and around $750 mln. in yearly terms. To put this in perspective, compare with the total net capital formation in 1929 of $10,49 bln, and the GDP of a bit more than $100 bln. In 2008, when the Chinese leadership were seriously afraid that the global economic crisis could significantly decrease the Chinese economic growth, they embarked on a range of measures to stimulate the economy. In the end, the main way these measures seem to have worked is through launching a construction boom which had no precedent in human history and perhaps will never be repeated again. Already in 2011, The Economist Intelligence Unit in the report titled “Building Rome in a Day…” was alarmed by the scale of the boom. According to the report’s calculation, at the end of 2010, China had the urban population of just 44.9%, yet it already had the residential space per head approaching that of the UK. The UK then had the level of urbanization of around 90% and the average disposable income level many times higher than China. Since then, the construction boom has continued for 4 more years. The potential magnitude of over-construction that this (as well as evidence like enormous ghost cities) suggests is simply beyond comprehension. 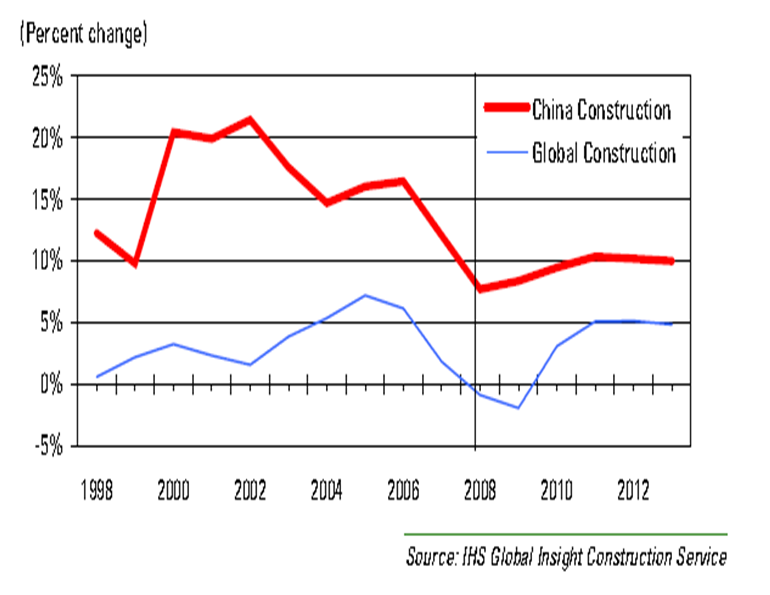 Looking at the chart above, one can notice that the growth rate in Chinese construction spending was falling rapidly after around 2006. Then there was a turnaround starting from 2008 which was probably fuelled by stimulus measures even before the main stimulus package was announced. 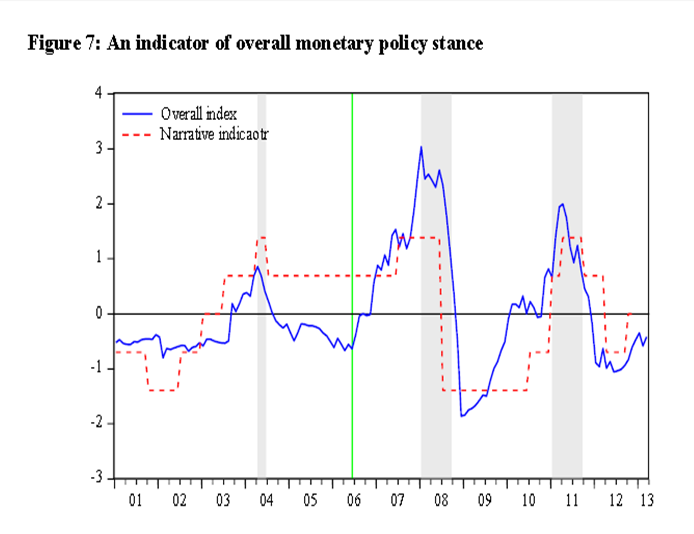 Indeed, the index of the Chinese monetary policy stance estimated by Sun (2014) suggests dramatic loosening of the monetary policy stance in early 2008 that continued until early 2009. Then, monetary policy was loosened substantially again in 2011. And it wasn’t just the China’s central bank’s loosening. As an example, in just the first six months of 2009 the big four Chinese state banks were ordered to lend the equivalent of 700 billion pounds. The main problem with this boom is that it means a waste of important resources on an enormous scale. In this post I will just deal with steel the importance of which for multiple production processes does not need to be explained (but there were of course other resources wasted on an astronomical scale, for instance cement and copper). The chart below illustrates the dynamics of steel production in the world, China and the US. 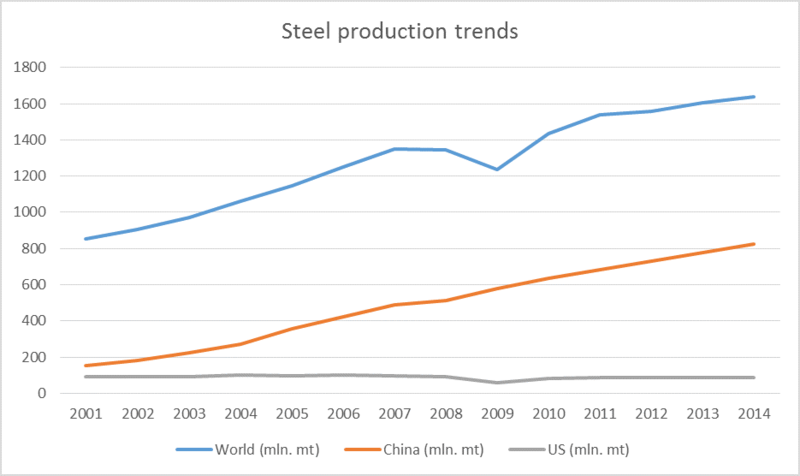 The chart is based on the World Steel Association’s data. It is notable that in 2014 China produced almost as much steel as the whole world in 2001, and half of the world’s total for 2014. Since the net steel imports have been relatively low (the highest share was around 9% (74 mln. mt) in 2014). If we reasonably hypothesize that at least the increase in the amount of steel produced after 2008 over the 2008 level was wasted in the stimulus (but perhaps it has been even higher), the resulting picture is staggering. If one also recalls that the construction boom meant colossal wasting of other resources like copper, cement, as well as many others, the title of this post ceases to be controversial. It is impossible to say at this stage how many people all over the world were and will be made substantially poorer because of this but this number is obviously very large. A course on the aggregation of preferences at my university, or more specifically, a cursory admission by the instructor that the aggregation of preferences taken as ordinal rankings is meaningless from the actual welfare point of view made me draw a connection between the meaninglessness of the aggregation of preferences and the socialist calculation debate. Recall that Hayek claimed that the main problem of socialism was that the planners don’t have access to the individual-level knowledge, including the knowledge of individuals’ utility functions. However, if the meaninglessness of aggregation is taken into account, it can be shown that even if planners had access to individuals’ utility functions (which in any event are a fiction), socialist calculation would still be impossible. To understand why, imagine an economy where all the capital has just been nationalized but market allocation of finished consumer goods was preserved. In the beginning of the first planning period the planners decide on the set of goods and services to be produced and distribute a certain amount of monetary units (valid until the end of the period) among the population. By the end of the period, they record a set of quantities of various goods and services sold and the relevant prices. For the following period the planners make some changes to the set of goods and services but distribute the money the same way. In the end of the period they get another set of quantities and prices. But the fundamental problem is that there is no rational way for the planners to compare the two sets of quantities and prices. And they would not be helped even if they could calculate a social utility function based on individual utilities. But an even more interesting question is why we can say that the allocation of resources in markets is relatively rational in contrast to the socialist case. It is not enough just to say that when an entrepreneur receives a profit after reallocating certain resources, it means that the relevant consumers were able to pay to her more than the consumers of the stuff which was previously produced with the help of the relevant capital and thus, the overall welfare has been enhanced. After all, it is possible to imagine cases in which (if they are taken individually) such reallocation may prima facie seem to decrease the overall welfare. Imagine, for instance, that the land under a popular skating rink is profitably reallocated to a golf club which is used by a few rich people in contrast to the skating rink being used by lots of people. It doesn’t seem suffice to say that the new owner of the land is earning higher profits than the previous owner who used the land for the skating rink. What allows to resolve this problem is a realization that it is only possible to have really high (in the total amount) profits for long periods of time if you are making substantial innovations useful for large swathes of people, allowing them to fulfil new needs or old needs in better ways (compare the total profits of Apple with those of Louis Vutton, for instance). But this is of course the case only because our world is as it is at the level of people’s actual abilities, resources and their ability to be transformed into valuable goods and services. In particular, the very rich don’t seem to be able to earn a really large share of income by producing stuff mostly for themselves mostly through their own contribution. Thus, even the hypothetical case with the skating rink can be resolved. If it isn’t analysed separately, one can see that the former owner gets paid for the land. This money can allow either her directly or someone else to whom she might lend the money to buy different capital goods, and it is more probable that that capital may be more profitable invested into serving larger numbers of people than the very rich again. As the third part of my dissertation project, I am trying to predict in which industries of the US economy we can see a boom-and-bust pattern in the near future given the highly expansionary monetary policy that the Fed has been conducting to boost the recovery from the Great Recession. Among many US industries, the chemical industry stands out in this respect. Companies in this industry have recently (between 2011 and August 2014) announced the undertaking of at least 196 projects aimed at building new chemical plants or upgrading or restarting old ones with projected investments in the amount of $124 bln. For the purposes of predicting business cycles, the new plants projects are more interesting because it they take more time to complete. Presumably, the relevant projects are already being reflected in the manufacturing construction figures published by St. Louis Fed (see below). And it is plausible that there is more going on than just the chemical industry. 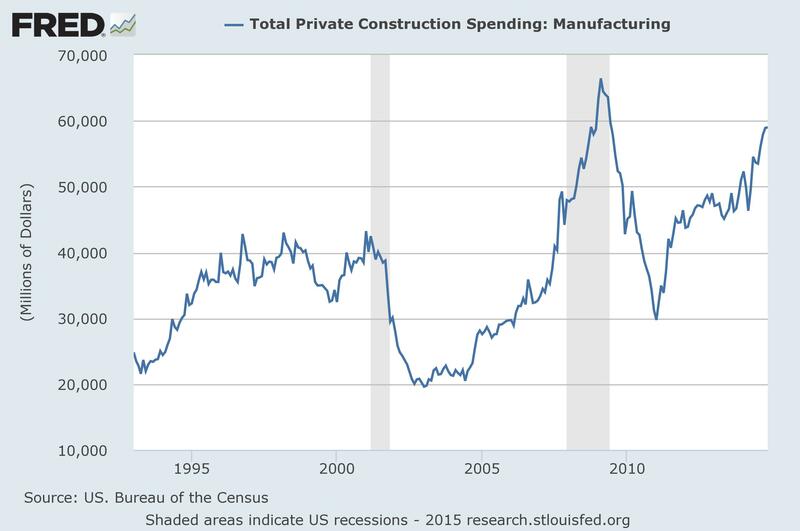 Manufacturing construction spending has almost reached its peak monthly level of February 2009 (especially given that the chart ends with October). Growth was especially strong in 2014 (from $46 bln. in March to $59 bln. in October, an increase by 28%). At the same time, the prices of the main intermediate and capital goods used in construction don’t show a similar dynamic. One can look at the PPI* for iron and steel products, for instance. Or at the PPI for concrete products. Or for construction machinery and equipment. Those discrepancy between the rising manufacturing construction spending and the dynamics of the prices of the inputs into construction is important because it may reflect the failure of prices of inputs to fully reflect the changed market conditions and thus lead to cost overruns for projects undertaken on borrowed funds. This is, in brief, the mechanism of a boom-and-bust pattern which I offered in the paper on the Austrian Business Cycle Theory which is forthcoming in the New Perspectives on Political Economy. However, a caveat is in order. This post isn’t a precise forecast of a boom and bust in the US. Even if I am right about the pattern, the power of accumulating innovation may compensate for the potential boom tendency. *The PPI data are from BLS. Reading Peter J. Evans on the Great Depression in Germany made me wonder whether the causes of the catastrophe without which, as Evans convincingly shows, Hitler would never have come to power were the same as in the US. This paper suggests that indeed they largely were. If there is widespread deflation it means that the revenue of many firms falls. Firms need to slash costs, including wages. But if wages are not allowed to fall (enough), firms will have (regardless of any Keynesian demagoguery) to lay people off. Thus, you get the mass unemployment disaster in the US and Germany. In Germany it was due not to the then government’s activism but due to trade unions and probably the general atmosphere of violence at the time, especially the violence by unemployed communists. Ironically, in contrast to Hoover in the US who did everything to make businesses keep wages from falling, German chancellor Heinrich Brüning tried to achieve the opposite result when the scope of the catastrophe became apparent. For this he was savaged and is still savaged by folks like Krugman. The final interesting question is to what extent the unemployment created through wage fixing causes falling output. There are two such ways which can’t be captured by Keynesian-style aggregate reasoning. One is that it is generally not possible to immediately replace the laid-off workers by capital. But there is another, a bit less obvious, reason. In the case of mass unemployment caused by preventing wages from falling in the face of deflation, people who retain their jobs with the same (or too high) wages are actually nominally better off than before the crisis because their purchasing power is higher. But the problem is that they can’t just replace the laid-off people’s consumption. One won’t necessarily increase the consumption of bread just because it’s price has fallen. Thus, to meet their additional needs, there should have been a substantial reshuffling of the production structure. Which of course takes time. Yesterday came very sad news. The author of unprecedented liberal reforms in Georgia, entrepreneur, philantropist, teacher, visionary, and one of the most extraordinary human beings, Kakha Bendukidze passed away in the age of 58. I had the honour to know Kakha personally, although not very closely, so I thought I should share some of my thoughts. The most memorable thing about Kakha was his frankness. He always said what he thought and as he thought it, bluntly and often very aphoristically. Perhaps, the most amazing words that he said were, “Everything is for sale, except conscience”. By this he meant that as the driver of the Georgian liberal reforms he would try to privatize as many government functions as possible but not for his or some politicians’ gain. Among other delightful turns of phrase I immediately recall were, “The only thing that should be owned by government is the Great Seal of the Realm” and “importing the institutions of civil society is like importing maturity”. I called the reforms that Kakha managed to push through in Georgia unprecedented for a reason. I am not aware of another example of such an extensive, deep and fast economic liberalization. Among the most impressive measures were essential abolition of antitrust and labour law (both formally stayed on the books but just formally) but lots of other things have been achieved. He even tried to abolish the central bank but did not have time for it. What was very unusual, though, was that, despite having been first a big businessman in Perestroika-era Russia and then a high-level statesman in Georgia, Kakha was never corrupted where almost anyone would have been. He always remained above all a teacher who was most excited when he could show people the truth, especially the truth of something which most people failed to see. Perhaps, his favourite project was the Free University of Tbilisi which he founded and in which he often lectured. And his students truly loved him. His dedication to seeking and promoting the truth meant that he was a passionate enemy of stupidity. The thing you were most terrified of in his presence was to say something stupid. I remember how scared I was of exactly this when I first met him in a restaurant in Tbilisi in May 2010. But after getting to know him you realized that even when he was very angry with people, it was because he wanted them to reach their true potential. When people like Kakha die I sincerely wish I could believe in the afterlife. But in tribute to his devotion to truth I cannot.